By David Salvi on Friday, January 27th, 2017 in Market Trends. Reality returned to the market in 2017, if only because the loss of confidence was less dramatic than it was in 2016. The initial shock of Brexit has subsided and prices have come down along the way. Gone are the heady days of buyers queuing to secure homes on launch day, now, we see buyers who are in it for the long term with more owner occupiers and fewer investors. Buyers remained cautious but it felt like a better time to buy than 2016, although if they hoped for a buyers’ market with discounts, they were disappointed as vendors were not so amenable. Forced sellers are a rare beast in these markets and, most owners are in the mood to ‘hold’ not ‘sell’. It was no surprise when The Royal Institute of Chartered Surveyors reported that the number of homes listed for sale had fallen to a record low in 2017.
off the value of an average one bed. 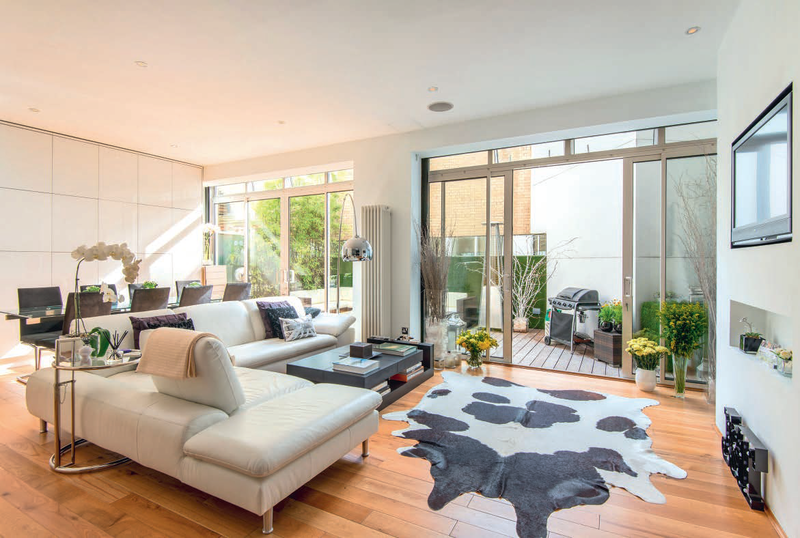 In the summer, we had hoped that the steepest price falls would be confined to properties over £1 million and that the market for one bedroom apartments would be relatively immune but uncertainty has taken its toll even in this part of the market. The unexpected General Election result may have been one shock too many, especially as the government continues to treat this part of the housing market as its very own ‘bank of mum and dad’ with an endless capacity to produce extra cash when it is needed through property taxes. 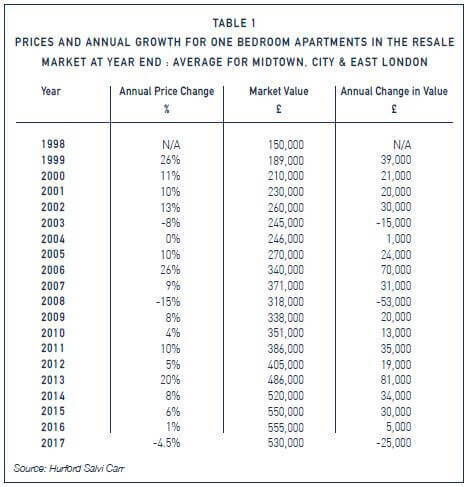 pied-a-terre buyers looking for a London base, parents buying for children close to one of the London Universities and a limited number of buy to let investors who see the current downturn as a buying opportunity. in our markets. The prospect of capital growth has always been the primary motivation but this has been lost, at least for the time being. Investors shy away from the 3% Stamp Duty surcharge and homebuyers have turned their attention to more affordable markets. Even the overseas investors, who stand to benefit from the weakness of sterling, have been scouring other cities in search of better returns. market would have weathered the stamp duty reform at the end of 2014, but the fact that stamp duty on properties below one million was reduced has been almost forgotten as the series of knockbacks since then have progressively undermined confidence across the wider market. Still it is the larger properties that have taken the brunt of the pain. In all three of our areas, the price of a three-bedroom apartment has fallen by 9% in the past 12 months and around 20% since the end of 2015. Those 3 bedroom apartments, were often included in design to satisfy planning requirements for “family homes” and the target market – whether families or luxury – was always limited. So far price changes for one-bedroom apartments still fall within the margins of a normal sale negotiation. The quest to own a piece of central London, following 5 years of exceptional growth between 2009 and 2014, waned in 2015 and finally ground to halt in 2016 and 2017 as buyers initially refused to contemplate paying higher rate Stamp Duty charges, then lost interest with the realisation that property prices had stopped rising and looked unlikely to grow for the foreseeable future. Home owners in central London rarely feel the need to sell in a buyers’ market as they are all sitting on substantial assets with limited borrowings. The average purchaser in the past 9 years has borrowed only 50% of the original purchase price, in part the result of tougher lending criteria introduced after the banking crisis in 2008. The result is an expanded rental sector where once potential buyers are now content in the knowledge that they are better off renting than buying as long as there is an abundance of homes to rent and their landlord pays for building insurance, repairs and on site services. rather than hand large sums over to the Government in Stamp Duty Tax. level prices are high but not generally above this threshold. In our markets the benefits are more limited. 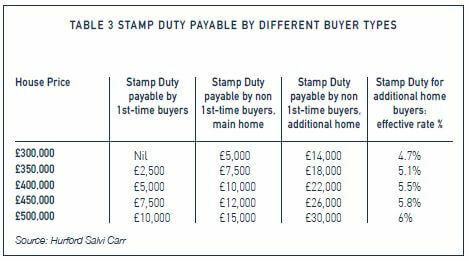 This will give FTB competitive advantage over other buyers who will have to pay 2% of the purchase price over £125,000 and 5% between £250,000 and £500,000. If it is an ‘additional home’, there will be an additional 3% surcharge on those rates. Table 3 sets out the difference in up-front costs for buyers competing for the same real estate. There are caveats which will disappoint some prospective buyers. Couples buying together must both be first time buyers. A buyer can only be a first time buyer(FTB) if they have never owned any interest in a property whether in the UK or overseas. However, the OBR estimated that the SDLT concession could translate directly into price growth of 0.3% over 5 years as buyers reassign the budget they would have spent on SDLT, to raise their bids. 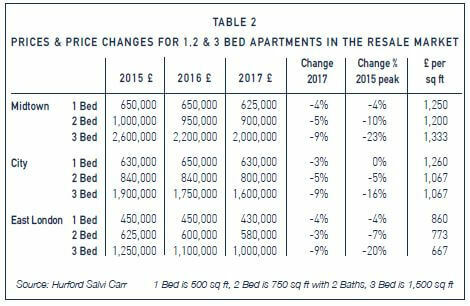 This logic is the reverse of the position on homes over £937,500 where the imposition of higher SDLT caused a fall in prices as vendors tended to absorb the additional purchase costs. ended with the Global Financial Crisis in 2008/9. In Midtown, the average growth for the period 1994-2017 was almost 23% per annum, whereas in the 10 years since the Global Financial Crisis growth has averaged just over 6% per annum. 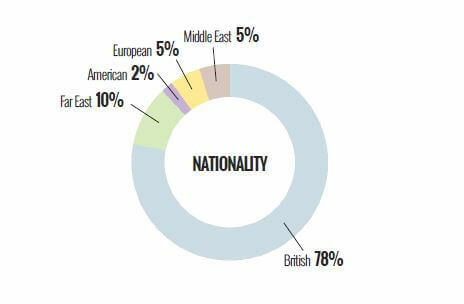 British buyers accounted for the vast majority of sales conducted through our offices in 2017. European buyers, who had made up 19% in the previous year, dropped to only 5% – and that is a smaller proportion of a less active market. Far Easterners were the most active group of overseas buyers, maintaining their market share at 10%, most of them from China. Back in 2013 and 2014, Far Eastern buyers made up between 20% and 25% of all sales but their share began to fall in 2015. The proportion of buy to let investors appears to have stabilised in 2017 at around 20%. They have, in the past, made up closer to a third of all sales. The pied-a-terre market has shrunk to half the level of 2016, falling from 10% to 5%. 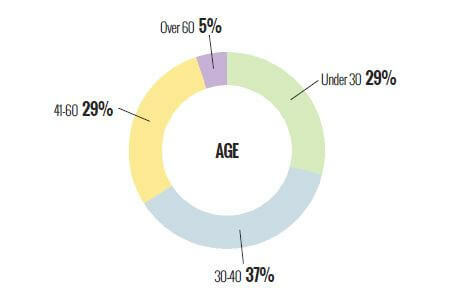 Perhaps they have made space for owner occupiers to enter the market, because their share has continued to climb, from 36% in 2016, to 49% in 2017.
figured larger than in previous years, accounting for 5% of buyers. Over 40% of all sales through our offices were funded entirely with cash in 2017. Cash buyers have always been common in our areas accounting, in the past, for around 30% of the market but changes to taxation for buy to let mortgage-holders have encouraged investors with the means to lean towards cash purchases.